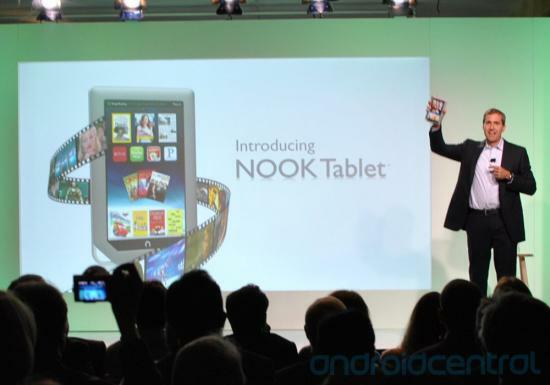 Finally, Nook Tablet has launched by Barnes& Noble for giving a tough competition to Amazon Kindle Fire. We already informed you about Nook Tablet so there is nothing new for you. This successor of Nook Color has got some specification upgrades. It comes with dual core 1GHz processor, 1GB RAM , 1080p video support for nine hours on a single charge. It is lighter than its predecessor with a weight less than a pound. Nook Tablet brings 16GB storage option as compared to 8GB of Amazon kindle Fire and you are able to extend memory up to 32GB with the mean of a micro SD card slot. Many readers will prefer Nook Tablet on Kindle Fire when they hear about this plenty space of Nook. B&N also provided a chance of readers to get full-time entertainment with the mean of NetFlix and Hulu which will provide video content to the users. In case you are interested in purchasing it then you can pre-order it right now for $249 while it will be available from 17 November. Check Full Press Release Below. NOOK Newsstand™: Choose from more than 250 newspapers and full-color, interactive magazines, delivered like magic to NOOK Tablet’s Active Shelf on the Home screen as soon as they become available. Barnes & Noble offers the largest digital collection of top 100 magazines, including PEOPLE, Food Network Magazine, Us Weekly, SPORTS ILLUSTRATED, TIME, National Geographic and many others. Colorful interactive magazines offer Barnes & Noble’s ArticleView™, new animated page turns and smooth pinch, zoom and panning. Many special edition NOOK Magazines™ feature videos, quizzes, image galleries and more. Enhanced reading:Readingis even more dynamic with PDF thumbnail page views, and image pinch, zoom and pan in books and PDFs. one of the Web’s largest e-commerce sites, which also features more than two million titles in its NOOK Bookstore™ (www.bn.com/ebooks). Through Barnes & Noble’s NOOK™ eReading product offering, customers can buy and read digital books and content on the widest range of platforms, including NOOK devices, partner company products, and the most popular mobile and computing devices using free NOOK software.